In Part One of the High Functioning Autism (aka Asperger’s) blog series, we explored the unique strengths and common traits of the Asperger’s brain setup. In this post, we will continue to celebrate neurodiversity (which is the idea that we all have neurological differences in how we think and learn) by sharing some of my favorite books on Asperger’s. An important key to success for many people with Asperger’s is to identify and nurture the strengths that often accompany this brain setup, as well as to uncover and develop work-arounds for potential blind spots and challenges that can occur. Actually, this is an important key to success for most individuals. Many people have told me that learning how their particular brain operates (and the brains of those they love) has played an important part in understanding and accepting themselves and others...and has helped them adjust their approach to succeed in relationships, life and work. So, if you or someone you care about has an Autism Spectrum diagnosis, or has Asperger traits (even if these traits don’t rise to the degree required for a diagnosis), check out the book list below. Christine Molina, LCSW, is a champion of neurodiversity and a skilled clinician at Therapy Austin. Christine developed this book list and has generously given us permission to share it on our blog. We know that everyone is different, and science shows us that everyone’s brains are different too—in how they process information and how they function in work, school and relationships. The What is Asperger’s? Information Sheet below is intended to celebrate some of the differences—especially the unique strengths and abilities—commonly found in people with High Functioning Autism (also known as Asperger’s). It can be helpful to think of High Functioning Autism, often known as Asperger’s, as a brain setup that affects people’s thinking and learning styles. Most people with this brain setup are very intelligent. People with this brain setup can see the details and the pattern of those details. They can see the flow of things. This helps them come up with unique solutions and approaches to problems that other people don’t see or notice. They want facts. These unique talents have allowed individuals in many fields to excel. People with Asperger’s are original thinkers, innovators, and a driving force in our culture. Some famous people who are thought to have Asperger’s are Albert Einstein, Isaac Newton, Benjamin Franklin, Thomas Jefferson, Aristotle, Charles Darwin, Andy Warhol, Bill Gates, Dan Aykroyd, Isaac Asimov, Alfred Hitchcock, Dr. Temple Grandin, Vernon Smith, and Emily Dickinson. Seeing Patterns and Connections (i.e., Higher Fluid Intelligence): Ability to find the connections and patterns among multi-disciplinary facts and ideas. People with Asperger’s have higher than average fluid intelligence, which allows them to draw inferences and understand the relationships between various concepts. This ability allows them to create new, coherent, and meaningful insights that others do not see. Focus and Diligence: Ability to focus on one objective over long periods of time without distraction. They can work alone for long periods without needing supervision or incentive. Internal Motivation: Rather than being swayed by social convention, other’s opinions, social pressure or fears, they can hold firm to their own purpose and opinion with conscience and personal pride. They do not give in to naysayers. They also have strong impulse control in many situations. Independent Thinking: Willingness to consider unpopular or unusual possibilities, which allows them to generate new options and opportunities and can pave the way for others. Visual Thinking: Some are very visual in their thought processes, which gives them a unique perspective when designing and creating solutions. They may learn better when they can see how something is done. Going Against the Flow: Ability to recognize and speak the truth that is being ignored or set aside by others, which can be vital to the success of a project or endeavor. Logical Decision Making: Ability to be very logical in their approach to problem solving; can make logical and rational decisions without being swayed by impulse or emotional reactions (although, they can be very emotional at times). Loyalty, Dependability, and Honesty: In relationships, exhibiting an absolute loyalty, impeccable dependability, and a determination to seek and speak the truth. They say exactly what they mean. Exceptional Memory in Certain Areas: Often possess an exceptional rote memory and/or recall of details often forgotten or disregarded by others (for example: names, dates, schedules, routines). Strength in Individual Sports or Games (particularly in sports/games involving endurance or visual accuracy): Often prefer and excel at individual rather than team sports. Metaphors and Puns: Ability to use advanced pictorial metaphors and a fascination with word-based humor, such as puns. Concrete: Prefer concrete, rather than abstract, concepts. Value of Precision and Accuracy: Ability to be very precise and accurate with tasks and words. This ability allows them to perform very complex and technical projects with no or minimal error. Higher Capacity for Routine Activities or Things: Ability to do the same things over and over without getting bored. Sensitive (or Under-Sensitive) to Sensory Experiences: Acute awareness (or a lack of awareness) of sensory experiences (such as, sounds, lights, touch, colors, and/or smells). An example of this is having an acute sense of smell that allows them to pick up on scents that others don’t notice. The above text is from “What Is Asperger’s?” Information Sheet, © Copyright 2015 by Carol York, MSSW, LCSW, and Christine Molina, LCSW. Revised February 2019. All Rights Reserved. Used with permission. Christine Molina, LCSW, is a champion of neurodiversity and a skilled clinician at Therapy Austin. Christine and her former clinical supervisor, Carol York, developed an information sheet on Asperger’s that lays out the strengths of people with this brain setup. Christine has generously given us permission to share this information on our blog. 'Tis the season for hustle and bustle, friends and family, presents and treats—and for loneliness, family conflict, budget crunch, and social anxiety. 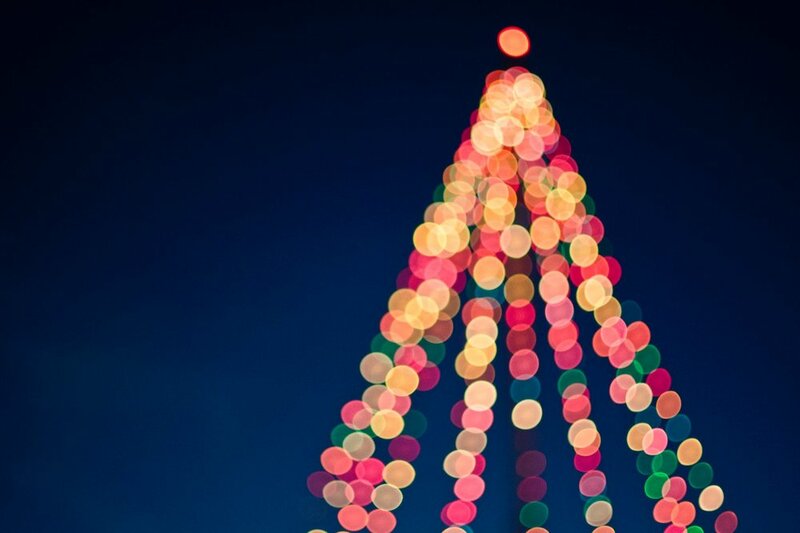 Do you ever struggle with how to handle the "most wonderful time of the year"? First, know that you are not alone. Difficult family dynamics, grief and loss, and memories of past stressful events come up for many people at this time of year, and may be intensified by our unrealistic expectations. We all have ideas of what our celebrations are “supposed” to look like, and it’s not easy for reality to live up to the ideal! Getting through the holidays requires that you have a plan. It can help to think ahead about where you will be, what you can anticipate and how you predict you might react. Pretending that things will be “different” this holiday or believing that somehow you will have a new experience with all the same old people doing all the same old things will get you what it’s always got you. But never fear—help is here! The Holiday Survival Guide is designed to help you develop tangible, workable coping strategies for dealing with the difficult emotions and interpersonal situations that the holidays can bring. Create a game plan with activities such as making an inventory of the most difficult people you anticipate dealing with and brainstorming how to minimize your judgments of them. Find practical “Dos and Don’ts,” such as avoiding “hanger” (hunger anger) by eating regularly, and limiting your caffeine intake. You can survive the holidays and hopefully enjoy some parts. Take a deep breath, ring them bells, and work through this extremely helpful packet. Sky lanterns in Chiang Mai. Photo courtesy of John Shedrick. Daylight Savings is done, the sky grows dark, and yet it is also a season of celebrating light and giving thanks. In India and Nepal, November 7 marks the beginning of Hindu celebration of Diwali, the joyful festival of lights, symbolizing the victory of light over darkness. 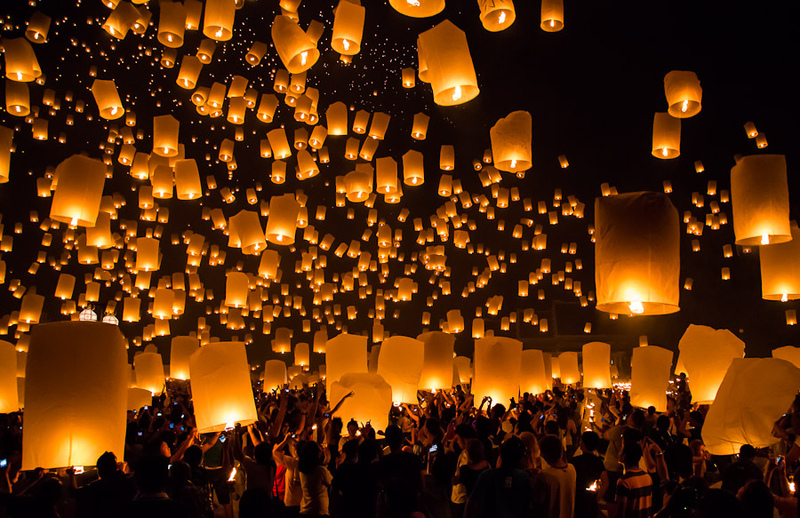 In Thailand, Yi Ping, a celebration of the full moon, will take place November 22, with the launch of thousands sky lanterns into the night sky. It can be easy to focus on the darkness. Our brains evolved recognize threats, but it can take extra effort to cultivate gratitude, light and joy. The following gratitude reflection comes from Still Mind: An Introduction to Meditation by Alan Watts (2014) and provides a way of turning our minds toward what is going well in our lives and honoring the light that is within us and around us. Welcome to the Counselor Spotlight series, where clinicians at Therapy Austin share what inspires them, how they take care of themselves, and what influenced them to work in this field. First up we have the brave Sarah Akunebu. Enjoy! For Sarah Akunebu, showing up as a professional counselor is important, but she also places great emphasis on being her most authentic self while doing healing work. She laughed, “I’m probably more of a human and less of a therapist” explaining those moments that I have with clients where we are connected human to human” is what she finds most meaningful in her work. She joyfully announced, “I don’t want to be Sarah the Therapist, I want to be Sarah doing therapy!”. She has even had clients return to working with her after a break and share how impactful her humanity in the therapy room has aided in their healing journey. Even though Sarah has found the just-right formula for her therapeutic practice, she continues to be surprised by “how dynamic it (being in the therapy room) is on the inside for the counselor”. She goes on to explain that at different stages in the therapeutic process she has hit the limit of growth in that stage, but the natural cycle of “being a human being” (ever evolving) presents her with a new opportunity to move into the next stage of development. She highlighted that during the 10th or 11th month at Therapy Austin she was able to recognize the depth of that work with clients, and also within herself. Sarah welcomes the reminder that she continues to grow professionally through those therapeutic relationships built with those longer-term clients. A few phrases Sarah often finds herself saying over and over to clients is “Tune In”, and she truly witnesses her clients’ experiences by telling them “I want to validate that for you”. She explained, “I want people to naturally tune into what is happening inside of them. Whether it be physical activity or an emotional state that is happening in the physical body, or that inner voice that is there”. Sarah believes that many people carry the very information they need to thrive, but are often told “it’s not important, or not to listen to it”. Sarah points out that for many adults, they are disconnected from that child-like part inside of them that allows them to be mystified by beautiful moments. SELF-CARE. SELF-CARE. SELF-CARE. That is what is drilled into most budding therapists while in school, and for good reason. Self-care is paramount to be able to do effective therapeutic work. Sarah described her self-care practice as “always evolving”, and explained that changing up her regimen helps to keep her grounded and recharged. Starting in early 2015, She began incorporating physical exercise into her self-care practice and it was a game changer. Sarah vowed, “I’m never going to give it up”. Additionally, she keeps a dream journal to “tune in” to her inner world, and incorporates daily prayer for moment of peace and quiet. One simple trick to help her get those important Z’s is “AIRPLANE MODE”, which she turns on all of her electronics at night. If self-care is paramount, then where a therapist seeks wisdom is a close-second for a strong therapeutic practice. Sarah shared that just as she encourages clients to tune in to themselves, she also must connect to herself to tap into her internal knowing. She explained that in the past she sought wisdom from outside of herself assuming that “they were wise because they were older”. She went on to explain, “Now, I realize that I was being stripped away of wisdom inside of me and told not to trust or speak on it. Now, I seek a sense of wisdom inside myself; speaking very clearly from that space and from my heart”. Sarah also looks to others who have had life experiences that brought them face to face with what it is to be a human being. She values their wisdom because they have learned to not take physical or emotional pain out on other people. Sarah is half Nigerian and half Mexican raised by immigrant parents in a home where different languages flowed throughout the house. She considers that a “really unique experience”. She has also experienced people not witnessing all of who she is, but rather only focusing on what she may look like or what language she speaks. This impacted her in the past, and she learned to channel that negative experience into creating openness and acceptance within in her therapeutic practice. “Being open to people, even those who look different from me, feeds my human side and my Sarah doing therapy side”. A big thank you to Sarah for letting us peek into her personal experience as a therapist! I hope you enjoyed getting know Sarah and if you feel you would like to hear more about Sarah’s practice and request an appointment with her, head over to her profile. Is there any form of writing more overlooked and disposable than the list? Perhaps cereal box copy or graffiti. Fleetingly relevant, the list is written to be scrapped. Yet, astonishingly, the lists of one Japanese noblewoman have endured for a thousand years. While serving as a lady-in-waiting, Sei Shōnagon famously compiled a loose collection of musings and narratives in list form known as The Pillow Book. We associate lists with utility, though under Sei Shōnagon’s brush, the form is expansive and suggestible. She touches on aesthetic delights as well as moments of pathos or longing. But in this eclectic chronicle, Sei Shōnagon never inhabits an emotional frequency overlong. She also takes acerbic pleasure in tallying Things Without Merit and People Who Look Pleased with Themselves, while Things That Lose by Being Painted includes men or women who are praised in romances as being beautiful. Though Sei Shōnagon was likely writing for an audience—she artfully reworked her observations—a pillow book is, in essence, confessional. These notes might literally be stashed beneath a pillow, but don’t miss their metaphorical import. The pillow comes into nightly contact with our sensing organs and breath, pressed closer than a sleeping partner, as we drift, as we dream. What else do you keep close? A pillow book urges us to intimately examine our surroundings, and, through this act of noticing, inclinations and biases. Soon your own headings will occur to you. You might list Things Left in the Employee Refrigerator, The Types of People I Forever Seem to Be Meeting, Things I Never Should Have Done Twice, or Things My Children Consider Possible and Impossible. A list does not have to be about you to be revealing. A list of Enviable People might prompt examination of why the people selected are enviable and what made you take this perspective. Significant omissions can be just as telling. Who would you leave off a list entitled People Who Will Always Tell Me the Truth? The list is a form to be filled. If you’d like to explore this and other mindful practices with the help of an experienced therapist, head to our Get Started page and request an appointment. I wondered if this was a helpful time to write a blog about loss, being at the tail end of our sunny Texas summer and months away from the holidays. However, I quickly remembered the heart of the message I want to convey in this piece; that being human is an inherently vulnerable experience, and loss is an inevitable part of being alive, no matter the season. If you are in the midst of grief, and feel like you would like some support, to explore it, or process through it, you are welcome to contact us. We are here for you. We know many of you have friends or family impacted by Hurricane Harvey. It can be frightening and overwhelming to see the news about the destruction happening across the Texas coast. In scary times like these, it can be helpful to do what Mr. Rogers suggested and look for the helpers. Wherever there are disasters, there are also good-hearted people who do their very best to provide aid. It can also be healing to become a helper, allowing us to shift from a helpless role to an active one. Here are some ways to help our neighbors. It’s totally normal to have a fearful, sad, angry or numb response following a natural disaster. Our brains aren’t made to respond to big, overwhelming bad news. And yet we can respond to a neighbor in need quite well. Connecting to others face-to-face and hand-to-hand during times of suffering can help ease the heartbreak, and can put us back in touch with our greatest strength-being there for each other. If you’re feeling overwhelmed, you do not have to go through that feeling alone. Visit our Get Started page to get connected with a counselor who can walk alongside you through the scary parts of your journey. Don't worry, neither of us is the good witch or wicked witch. We contain both sides--just like Glinda and Elphaba. I know, I know, I know. Just the title of this post sounds a little too mushy to keep reading. But this is the FEELINGS business, people! And so I’d like to discuss one of the feelings that comes up often in the therapist-client relationship – L.O.V.E. You may be curious about if your therapist can really love you. If you’ve been in therapy before, you know that boundaries are a really important part of it. The amount of time spent together, the location, the fee, and the sharing of resources all create boundaries in therapy. And therapists cannot have dual relationships with their clients, such as being friends or having romantic encounters. I appreciate all of these boundaries because they actually make it safe for therapists to love our clients in a way that is healthy and healing. It's not the same love as that of a partner, parent, sibling or friend. It has a place of its own. My love for my clients is kind of like this: I want to take the bravest part of me, the most accepting part of me, the most magnanimous and mindful part of me, and give it to you as a gift. I feel so honored to get to be there to watch your lives unfolding. I want to provide a space for that unfolding, to hold open all the possibilities of who you are and who you are becoming. Without judgement, without telling you what you “should” do. Together we can create a space that has room for the whole story, the scary parts and the funny parts, the lonely parts and the together parts. It makes me smile to think about how enormous and long and unique your stories are, how full of grit, and courage, and connection. I expect there will be many more twists in your stories! Because of the boundaries on the therapeutic relationship, I do not share with you all the things about me and my life. (After all, I wouldn’t want your session to become about me!) But I want you to know that your unfolding stories are woven into my experience of the world. I long for justice when you share with me the ways you have been harmed by the world and the people in it. I feel hopeful when I see you build up your resources to meet challenges. I feel gratitude when I hear about the webs of family and friendship that cocoon around you in times of sadness and fear, and stretch to let you explore in times of growth and change. You are a part of my web. Your ideas and feelings and actions float through me, surprise me, inspire me. Hearing your stories unfold each week changes my own story. Thank you for letting me be your therapist. Thank you for letting me draw upon my best self to meet you and help you draw upon your best self. I believe that because of our time together, we will be changed for good. Are you wanting to get connected with a therapist who will accept and explore your WHOLE story? Learn about Therapy Austin’s Counselors and then fill out our easy, confidential online request form to Get Started. One of my favorite movie scenes is from Good Will Hunting. After only a few months of therapy, Will, the main character, has a major breakthrough in his therapist’s office. Then, he weeps into his therapist’s arms, he walks out the door a changed man, and changes his life. It’s such a moving scene. We’ve been rooting for his character, and it’s touching to see him transform and live the life he deserves. We all wish for moments like that. For that dramatic change that we’ve been working so hard for to instantaneously emerge and forever alter the course of our life. Many people imagine that going to therapy is all for the lead up to that one, giant insight that changes your life. And it is true that some people, whether they are in therapy or not, certainly do have major breakthroughs that alter their inner world and life outside of it. For most of us, however, change and growth take a different pace. The truth is change is often slow. Unhurried. And occurs in tiny moments that can be easy to miss. I know this is probably not what you wanted to hear. When you’ve been living with a problem that you’re becoming more and more aware of, it makes sense to want the change to happen now. I get it. It’s frustrating. We also live in a success-driven culture obsessed with fast results. So it can be very easy to feel like we’re not measuring up when change is taking its sweet time. But after living with a problem for so many years, it also makes sense that it would take time for new patterns to develop. In fact, this is how healing and growth actually occur. Our psyches are designed to fall apart so that we have the opportunity to go through the process of putting them back together, building upon novel experiences and perspectives one step at a time. A new form slowly takes shape, one that includes what has happened in the past that engendered our crumbling, along with the new, higher-order understanding of ourselves and our experience. This is solid, lasting change, built from the bottom up. And we can’t make it happen any faster than it needs to. The beautiful thing about this kind of change, though, is it allows us to grow into it. So often, we don’t even realize it’s happening because what is happening feels so hard. Feels like we’re never going to get there. Feels like we’re doing life wrong because we’re not there yet. When, actually, deep change is occurring under the current of these stories in the mind. You are on the path. The willingness to struggle and tolerate uncertainty and darkness is the very manifestation of growth. The kind of growth that stays with you for life. There is potential for profound transformation in falling apart and rebuilding, one slow step at a time. Trust that your growth is happening in every moment of struggle that you stay with yourself and honor the unique, precious rhythm of your life. To assist in your process, take a look at our outstanding counselors to request an appointment. There is no shortage of cultural messaging that equates sensitivity with weakness. But it turns out, all humans are sensitive in that we all experience the world around us through our senses: touch, sight, hearing, smell and taste. The information these senses provide about our environment and our bodies leads us to have feelings. Perhaps that’s where the word “feeling” comes from – we feel the sensations in our bodies that are connected to our emotional states. In the English language, we have many idioms that demonstrate the connection between sensations and emotions. At different points throughout life we may experience butterflies in our stomach, a knee-jerk reaction, a broken heart, or the need to get something off our chest. These phrases aren’t an accident. Our nervous system connects our body and brain through a network of nerve cells that reach all the way to our fingertips and toes, like a series of roads conveying information back and forth. Sensations, emotions, emotions, sensations. For some of us, these roads are lightning quick, or rumble with reverberations as information travels up and down them. In fact, for about 20% of the population, the five senses are more highly tuned than average, and the feelings they connect to can be more intense. In her book The Highly Sensitive Person: How to Thrive When the World Overwhelms You (1997), Dr. Elaine Aron explains that for the fifth of the population whose nervous systems are more sensitive, the experience of the environment can be overstimulating. Loud noises may startle them. Harsh smells may be intolerable. A slight change in the temperature may cause a strong reaction in their bodies. And because sensations are so closely tied to feelings, “Highly Sensitive Persons,” or HSPs, may also have more intense internal experiences, such as vivid imaginations, heightened emotional reactions, being deeply affected by others’ emotions, and having difficulty “turning off” their brains. These traits can be both a gift and a challenge. According to Aron, HSPs “tend to be enormously aware of the suffering of others,” allowing them to have great empathy, and a capacity for deep and fulfilling relationships. However, the intensity of HSPs’ feelings can lead to exhaustion and burnout if their nervous systems are continuously overwhelmed without the chance to recharge. If you’re interested in further exploring ways to cope with being highly sensitive, you can request an appointment on our Get Started page! How’s everybody feeling about Thanksgiving? Are you ready for some family bonding, planning to spend it with friends who make up your “chosen family,” or anticipating some time for solitude? Even without an election, the holiday season can bring up feelings of anxiousness, anger, fear and grief. This year as our country faces some major upheaval, I personally have been worried about the conflicts that might arise at Turkey Time. I’ve been digging through my psychotherapy “toolkit” to find ideas for creating healthy boundaries, diffusing conflict, and taking care of yourself this holiday season. It can be transformational to listen and validate the feelings of someone we disagree with. Recognize that all feelings are valid. Whatever you are feeling right now and in the weeks ahead, it is okay to feel that way. When we notice our feelings and just let them exist without judging them or acting on them, it gives us the opportunity to put some mental space between the moment the feeling occurs and the moment we decide to act. Try an activity that allows you to breathe into your feelings before reacting to them. Many of my clients find yoga, mindful breathing, or vigorous exercise helps them to do this. When I was in kindergarten my best friend’s grandmother went to Germany and brought home a piece of the Berlin Wall. I held it in my hands. This small story immediate conjures up the sensation of touching an oblong chunk of crumbling, graffitied concrete that is touchpoint for many meanings: Walls can be torn down. Countries can right themselves. Families on different sides can be reunited. Can you think of a story like this? Maybe it is something you could share with family and friends to highlight values that we all share. I hope that the upcoming holidays give you many opportunities to build healthy boundaries and strengthen your relationships with others. If you find it would be helpful to talk through these ideas and get extra support, our doors are open at Therapy Austin. Schedule an appointment today-we are here to help! Anger gets a bad rap, and I don’t quite understand why. We’ve all heard that anger really only hurts us in the end, and that the first person to get angry loses the argument, and that we have two wolves inside us and we can’t feed the angry one. Yeah, yeah. Sure. Those things are all probably true on some level. But, humans have had anger as an emotion for thousands of years. We haven’t evolved out of it, and chances are, we’re not going to. Is something so completely natural really...toxic? I don’t think so. Just like all of our emotions, it’s here to tell us something. It has information for us, and we need to know whatever it is that our anger is trying to tell us. When did you last get angry? Like reeeeally white hot, blaze-of-glory angry? Who were you talking to? What were you doing? Were you feeling threatened? Devalued? Or maybe you were fighting for something or someone you really love. Maybe, underneath that anger, you were very hurt, and you didn’t feel comfortable expressing your pain. Maybe, because you live in Austin, Texas, you were in traffic on 35, and let me just take a minute to normalize that anger, friend! Anger is like our emotional body guard. Times when we aren’t emotionally safe to be vulnerable, or when we think we won’t be heard, are times when anger comes out to protect us. Remember that cute Pixar movie, Inside Out? When Joy and Sadness went AWOL, Anger stepped up to the plate, because Anger can take control. Anger is strong, anger is passionate. Anger protects us. We need it when, for whatever reason, we can’t give room to our joy and our sadness. Now, please don’t misunderstand me; stewing in your anger or letting it jump in the driver's seat whenever it wants to, is not going to get you where you want to go. Unless where you want to go is a very isolated, lonely place full of health problems. But, funnily enough, ignoring it, denying it exists, will take you to that same place. Recently, a client shared with me that she views her anger like a monster that lives under her bed, and she’s trying to starve it so it dies. I don’t know if you’ve ever had a pet that you’ve forgotten to feed for a few hours, but I have definitely done that, and let me tell you how loudly angry my cat can get. And rightly so; she was pissed with me! It’s a great example of how her anger helped her get her needs met. If you starve your anger, all that will happen is that it will start screaming at you. Just like our other emotions, anger can be explored, understood, and expressed effectively and safely. Scream in your car, punch some pillows, write a nasty letter and burn it (safely!). Expressing anger, as long as you aren't hurting anyone (including yourself!) is incredibly healthy. But listen to your anger, learn from it. Maybe you're angry with someone for crossing a boundary, and maybe your anger can help you know where that boundary actually lies. Maybe anger can give you clues to discover your values, and maybe it can help you assert your feelings when someone has treated you poorly. Maybe it shows you what you’re truly passionate about. If there’s no anger, there’s no passion. The funny thing about anger is, the more we give it our mindful, intentional attention, the less intensely we experience it. So, my dears, would you like to have a better relationship with your anger? We’ve all got monsters under our bed, but if we invite them to come out and play in safe ways from time to time, maybe they don’t have to be monsters that haunt us. We love your angry side. We love that healthy voice inside you that says “I do not deserve mistreatment.” We even love the anger that's gotten away from you a little, and we love helping you meet it on different terms. We welcome your anger with open arms. Bring your little monster in, and we’ll teach you how to talk to it, and how to love it. We've got you. Head on over to our Get Started page, and let’s get angry friends. When I was in grad school, we had to attend 10 therapy sessions of our own, because the best way to learn is to experience it for yourself. I remember very adamantly telling my counselor that I was in therapy because it was required for school, not because “anything is wrong.” And, because she was a great counselor, she gently called me out. If you’re following us on Facebook, you’ve heard by now that May is Mental Health month, and that we’re spending the month pledging to be stigma free here at Therapy Austin. It’s worth acknowledging that the stigma has affected us all, often in ways that are so subtle, we might not recognize the effects until much later. This idea that it’s weak to seek therapy, or that if you’re in therapy something must be “wrong with you,” is so pervasive, and also so dangerous. Let’s pretend the same stigma existed with seeking help for physical illness, because I continue to be amazed at how differently we treat our physical health and our mental health. If I had pneumonia, and a stigma existed around seeking medication and the care of a doctor, I might be discouraged from getting the help I needed. And I might get worse. I might even die! The idea that we might shame someone for getting medical treatment is pretty ridiculous, but we do this with mental health regularly. But, mental illness isn’t necessarily all that different from physical illness. It’s common, it’s disruptive to our lives, sometimes it can be easily treated and sometimes treatment can be more involved. Mental illness can be as serious and life threatening as physical illness, and when we’re discouraged from getting treatment because of what the world might think of us, our safety can be at risk. So how do we fight something that is so deeply ingrained in our world, and so incredibly unhelpful to so many of our friends, family members and coworkers? This is often the way that we can accidentally perpetuate a stigma. We tend to use psychological terms to express eccentricities in ourselves or others, which can be really hurtful to someone who is really suffering from from mental illness. For example, have you ever heard someone say that their friend is “so schizophrenic” because they had a mood swing and seemed like they had one attitude one minute and a different attitude the next? First off, mood swings can be totally normal and appropriate and we all have them. Far be it for us to condemn someone for experiencing a change of heart. Also, schizophrenia is actually not even the disorder of someone whose personality “switches;” that’s a dissociative disorder that’s often the result of severe trauma. We don’t want to feed into these myths that exist around mental illness. Here’s a fun game: imagine telling a friend that they were “such a cancer patient” if they were lethargic or unwell. I’m willing to bet that feels pretty… gross. One in five Americans suffer from mental illness. That’s 20%! When you’re hanging out in Ethos or Thunderbird Cafe, or wherever your cool locally-owned Austin coffee place is, count the people within earshot and ask yourself how many of them, statistically speaking, suffer from mental illness. Now imagine saying one of those sentences that invalidates and shames mental illness. We can help bring a sense of normalcy to mental illness by learning more about it, talking to those who suffer from mental illness, and understanding the ways that we can be compassionate and caring toward them. The National Alliance on Mental Illness is a wonderful resource. Therapy Austin clinicians will be wearing green and enjoying the sunshine on the NAMI front lawn this Saturday the 21st, listening to live music and joining the conversation of how we can keep fighting to end the stigma from 1130-130. There is such strength in seeking the help you need and deserve. No man is a mental island, and we’re here to help you when you need, with knowledge of mental illness, compassionate understanding of what you’re going through, and a safe non-judgmental space where you can feel more free of the stigma. Check out our Get Started page to request an appointment! The elusive pack of 100 colored pencils: why do we love adult coloring? Coloring books are just about everywhere right now. If you didn't get one as a gift over the holidays, you've definitely seen them in Target or Barnes and Noble. Adult coloring books are so popular that they were partly responsible for a spike in printed media in 2015 in the US. So what's the deal? Why are our grown-up friends and family members (not to mention our therapists!) curling up on couches across the country to ... color? Humans have been using art as therapy for hundreds of years. In Tibet, it's a common practice of many monks to create mandalas, beautiful and repetitive works of art created from colored sand. The monks pray over the mandalas, and then wash the mandalas away, to carry their blessings to distant shores. In many American Indian cultures and Mayan cultures, circles and repetition are used to convey and promote healing; we even see this in our own culture, like when we say we're "bringing things full circle." Coloring methodically in a repetitive circle is used in a lot of art therapy modalities, and these coloring books are bringing the healing to our own couches! Now, in our fast-paced, bustling lives, it's easy to think of something like coloring a mandala to be pointless or unproductive, but I really think that that's part of their beauty, too. Isn't it worth doing something soothing just for soothing's sake? What a gracious relief it must be to our brains to spend some intentional time on something as light and easy as coloring a mandala. You might even take a stab at a free-hand mandala, because we could all use a reminder that nothing is perfect. In fact, a lot of neurobiologists and neuropsychologists are curious about the affects that coloring is having on our brains. Coloring engages our pre-frontal cortex in what we call "low level brain activity:" enough to keep your focus, but not enough to overwork you. Our pre-frontal cortex is where a lot of our fancy-pants higher functioning and reasoning skills live. It works all day, helping us make choices that keep us safe and happy. A lot of neuroscientists are arguing that engaging your pre-frontal cortex in low level activity like coloring is incredibly relaxing to your brain: 'which color to choose for this swirl' is likely a much easier decision for your brain than 'how to ask for a raise at work." In fact, just reminding us of the simplicity of life might be one of the reasons that coloring has become so popular. There's a huge link between our relationship with our inner child and our overall self-esteem. Think about times when you've felt your self-worth was taking a hit, or you were grappling with your own insecurities. It's likely that the negative beliefs you were having about yourself were things you picked up along the way from difficult situations in your life. Re-visiting those younger times and soothing that part of yourself can help to heal some of those wounds. So color on, friends! There are lots of good self-care opportunities involving coloring, and lots of good reasons to do it. Might I also suggest your favorite soothing music while you color, or maybe a lavender scented candle for relaxation? Check out our self-soothe kit post for some ideas. One of my favorite things about the adult coloring fad has been indulging my inner child with that 100-color pack of colored pencils that I wasn't allowed to have when I was younger! Treat yo' self! Many of our Therapy Austin clinicians are trained in art therapy, which can been a deep and symbolic experience for clients. Request an appointment if you've got the itch to color and heal! I’m standing in line at Strange Brew in South Austin last week, reading the board and trying to choose a sandwich to go with my latte. I’m looking forward to settling down for a few hours of research and catching up on paperwork. Before I’m ready, the barista calls me, never standing still as he flits between the register and the myriad other jobs he’s doing behind the counter. Immediately caught up in the speed of his energy, I panic a little bit, totally forget the sandwich, order my latte and sit down. I’ll get my stuff set up, sit for a bit while I re-group, and then go back to stand in line for a second time to order my sandwich with a little more time to think. Not too long ago, this interaction would have stirred up so much embarrassment and discomfort, I probably would have taken my latte and left. Introverts often get some hard knocks in our world. The concept is widely misunderstood (shy is the last thing that I am), and it’s often said that our world is set up for extroverts. Introverts have a harder time making snap decisions and like to process what they say before they say it. With all of our technology, it seems like the world is just spinning faster and faster, and that can be a difficult way for an introvert to exist. In fact, when we feel a little out of step with the visible world, it can sometimes make us think they’re something wrong with us. But what are some of the wonderful things about being a person who likes to slow things down a bit? Introverted people have the ability to foster deeply intimate and meaningful connections with other people. Generally not interested in small talk, your introverted friends or partners will probably want to know more about your dreams and deepest beliefs than they will want to hear about your lunch that day. Introverted people are also really great listeners, partly because they like to take time to formulate their responses intentionally, so you’ll have plenty of room to speak. Introverted people are pretty happy to be left alone with their own thoughts, and as a result, they usually have a good knowledge of their boundaries and the things they like. If you put in the time to get to know your introvert, chances are you’ll get rich authenticity in return. The introvert is also often a beautifully creative soul. When someone likes to spend a lot of time with their thoughts, their thoughts have the space and time to grow abstract, hypothetical, and fantastical. If you give an introverted person space and help them to feel safe when sharing with you, they’ll reward you with detailed and interesting musings about the world that can make you see things in a whole new light. Like all other things, introversion looks different in each individual, and each of us might appreciate different aspects of being introverted, or see introversion differently. I’m happy to get to share with you some of my favorite responses from people when I asked them about their favorite parts of introversion. How do you walk through the world? If you’re feeling a little out of step, well… you know what to do!